In response to growing controversies in Israel regarding anti-gay surrogacy legislation and the homophobic letter signed by 200 prominent Orthodox Dati Leumi (national religious) rabbis in Israel, nearly 700 rabbis from across the United States and Canada signed on to A Wider Bridge’s letter, committing LGBTQ acceptance and equal rights in Israel. 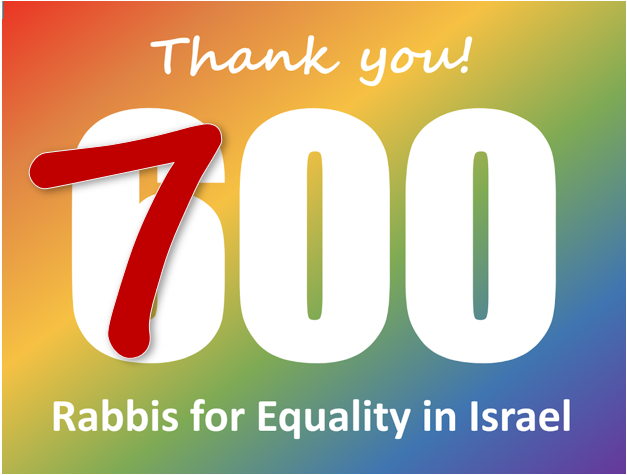 We, the undersigned rabbis from across the spectrum of movements, join together in support for full LGBTQ equality and acceptance in Israel. We join together to decry the rise of intolerance, discrimination and Sinat Chinam, baseless hatred, against the LGBTQ community in Israel. In light of a recent letter, signed by 200 prominent Israeli rabbis, labeling LGBTQ people with hateful and demeaning insults, as well as condemning their children to a “wretched” existence, we lift our own voices not in hatred, but out of the deepest love and concern for all the people of Israel. Furthermore, in light of recent legislation barring gay men from surrogacy, we call on the Israeli leadership to reverse its discriminatory policy in favor of equal rights for all citizens. We declare that these recent actions violate the Torah’s most precious principles–most notably that of Pikuach Nefesh, the command to save and preserve life above all else. The enshrining of discrimination into law, and harmful words spoken by religious leaders, sow the seeds of hatred and brutality in the land, and put vulnerable members of Israeli society at risk of violence and worse. We respectfully remind our colleagues and fellow leaders in Israel that in this week’s Parashat Ekev, G-d reminds us, “Aseh mishpat yetom v’almanah, v’ohev ger latet lo lechem v’simlah”, that G-d “Upholds the cause of the orphan and widow, and loves the stranger, providing him with food and clothing” (Deut. 10:18). These words, together with G-d’s charge “V’ahavta LeRe’echa Kamocha,” “You shall love your neighbor as yourself” (Lev. 19:18) remind us of the command of the Jewish people to fashion a society where the most vulnerable are protected, and the humanity of every human being, created B’Tzelem Elokim, in G-d’s image, is honored. We, therefore, call on Israeli leaders and rabbis to retract these recent actions and return the State of Israel in T’shuvah, to this higher level of sanctity, dignity and safety. 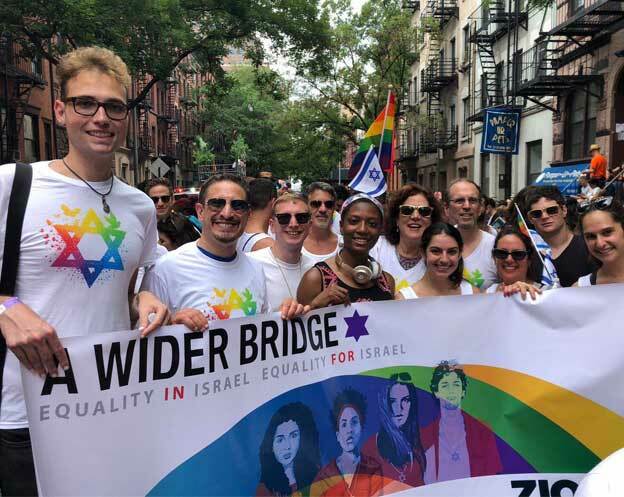 This week marks the 2018 Jerusalem March for Pride and Tolerance, a time to recognize the LGBTQ community of Jerusalem and the freedom of all communities to live proudly and freely, side by side all other citizens, in the democratic state of Israel. Israel has been, and continues to be, an Ohr LaGoyim, a Light to the Nations, through its embrace of democratic and pluralist values, where all Jewish peoples, together with other peoples, can find safety, refuge and a decent life. Three years ago at Jerusalem Pride, Shira Banki was brutally murdered by a man claiming to act in the name of Torah. While we all can agree that hatred, violence and murder are, in fact, nothing short of a Chilul HaShem, a desecration of God’s Name, we must similarly recognize that the recent rabbinic letter, as well as recent legislation, reflect a dehumanizing mindset that could, G-d forbid, lead to more tragedies like Shira’s murder in the future. We, therefore, further call on the Knesset to work toward equal rights for LGBTQ people in Israel under the law. In calling for these rights, including surrogacy, we call on the Israeli leadership to reiterate the separation of religion and state as an ideal of democracy. Indeed, we affirm that we must choose life–the life of all people equally in Israel — as our highest shared value. We must ensure that Jewish people, together with all the inhabitants of Israel, enjoy equal access to a life of dignity, of family, of safety, and of blessing. As Parashat Ekev says, “Lema’an yirbu yemeichem, v’y’mei v’neichem alha’adamah…”, “…in order that you and your children endure on the Land that the Lord swore to your ancestors to assign them, as long as there is a heaven over the earth.” May we live up to our charge to fashion a life of dignity and sacredness and make this blessing true for all generations to come. For the letter in Hebrew, click here. To add your name to the letter, click here.